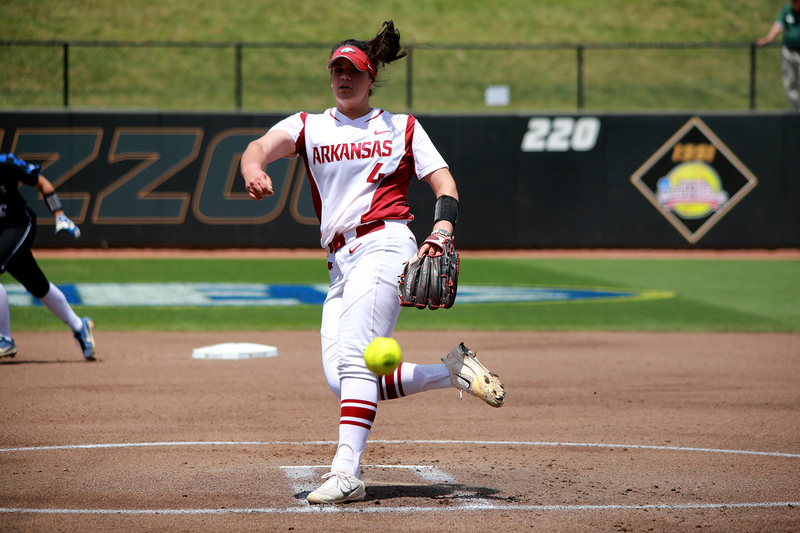 DURHAM, N.C. – With the start of the 2019 season on the horizon, four Razorbacks find themselves on Softball America’s Top 100 Player Ranking: sophomores Mary Haff, Hannah McEwen and transfer Danielle Gibson, and junior transfer Ryan Jackson. Haff was the highest ranked player for Arkansas, coming in at number 18. The sophomore recently earned a spot on the All-SEC Preseason team and was listed as part of USA Softball’s Top-50 Watch List for Player of the Year. The honor is added to Haff’s already impressive list of awards, which include Schutt Sports/NFCA Division I National Freshman of the Year Top-Three Finalist, NFCA All-South Region Second Team, SEC All-Tournament Team, All-SEC Second Team, SEC All-Freshman Team and three-time SEC Freshman of the Week. Coming in at number 40, McEwen was only one of three players to start all 59 games of the 2018 season. McEwen led Arkansas in multiple offensive categories, including batting average, on base percentage, runs scored, RBI and hits. McEwen’s 57 RBI set a new Razorback single-season record. Already garnering recognition in the cardinal and white, Arizona State transfer Gibson shined as a freshman for the Sun Devils. She had 16 multi-hit games, including two games in which she recorded multiple home runs. After a stellar freshman season, Gibson was one of three freshmen to be named to the All-PAC-12 First Team in 2018, in addition to be named to the All-PAC-12 Freshman team. Rounding out the Razorbacks in the ranks, Jackson begins her first season at Arkansas after playing her first two years at Bethune-Cookman. As a two-time MEAC Player of the Year, Jackson led the league in on-base percentage (.467), RBI (50), runs scored (54), total bases (127) and home runs (17) as a sophomore. Her 17 dingers stands as a single-season record at Bethune-Cookman. For more information about Arkansas Softball, follow @RazorbackSB on Facebook, Instagram, and Twitter.